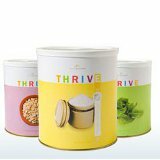 Did you know that the THRIVE brand of cornmeal is made with the whole grain? Many brands of corn bread are not. I love this because we are trying to eat more whole grains. Sweet Cornbread: This recipe is modified from the recipe in the “sample pack recipes” from shelf reliance. I have simplified the directions so it is not so fussy. We like to eat this with honey butter. Here is the recipe I use. Using wire whisk or Kitchen Aid beat ingredients until creamy.